Digital libraries can be deployed at many points throughout the life cycles of scientific research projects from their inception through data collection, analysis, documentation, publication, curation, preservation, and stewardship. Requirements for digital libraries to manage research data vary along many dimensions, including life cycle, scale, research domain, and types and degrees of openness. 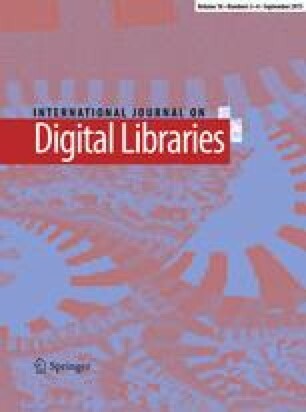 This article addresses the role of digital libraries in knowledge infrastructures for science, presenting evidence from long-term studies of four research sites. Findings are based on interviews (\(n=208\)), ethnographic fieldwork, document analysis, and historical archival research about scientific data practices, conducted over the course of more than a decade. The Transformation of Knowledge, Culture, and Practice in Data-Driven Science: A Knowledge Infrastructures Perspective project is based on a 2 \(\times \) 2 design, comparing two “big science” astronomy sites with two “little science” sites that span physical sciences, life sciences, and engineering, and on dimensions of project scale and temporal stage of life cycle. The two astronomy sites invested in digital libraries for data management as part of their initial research design, whereas the smaller sites made smaller investments at later stages. Role specialization varies along the same lines, with the larger projects investing in information professionals, and smaller teams carrying out their own activities internally. Sites making the largest investments in digital libraries appear to view their datasets as their primary scientific legacy, while other sites stake their legacy elsewhere. Those investing in digital libraries are more concerned with the release and reuse of data; types and degrees of openness vary accordingly. The need for expertise in digital libraries, data science, and data stewardship is apparent throughout all four sites. Examples are presented of the challenges in designing digital libraries and knowledge infrastructures to manage and steward research data. The research reported in this paper is supported by Alfred P. Sloan Foundation Award #20113194, The Transformation of Knowledge, Culture and Practice in Data-Driven Science: A Knowledge Infrastructures Perspective. We are grateful to our program officer, Joshua Greenberg, and to our external advisory board—Alyssa Goodman, George Djorgovski, and Alex Szalay—for their guidance and support. We also acknowledge the contributions of Laura A. Wynholds and David S. Fearon, Jr. for conducting early interviews; and Elaine Levia for technical, bibliographic, and administrative support.